Home » Accounting Dictionary » What is an Income Statement? Definition: The income statement also called a profit and loss statement is a report made by company management that shows the revenue, expenses, and net income or loss for a period. The income statement is one of the main four financial statements that are issued by companies: balance sheet, income statement, statement of owner’s equity, and statement of cash flows. What Does Income Statement Mean? The income statement shows income and expenses for a specific period of time. This could be monthly, quarterly, semi-annually, or annually. 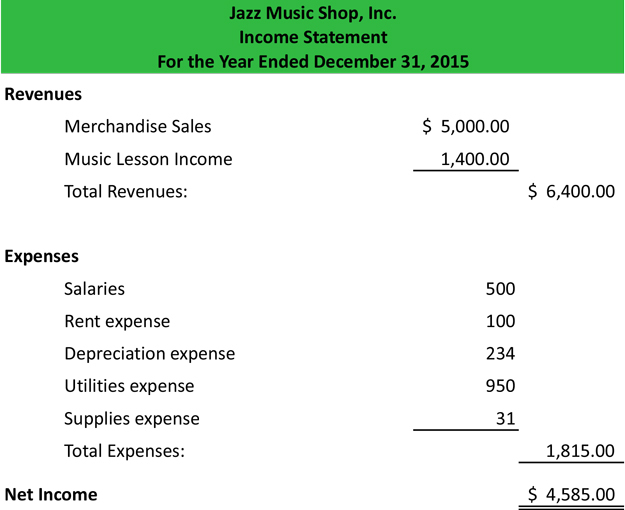 A January income statement for example would show all the income and expenses for the month. It would also show the net income or loss at the end of January. Income statements created for management are usually shorter in time frame. These weekly or monthly income statements help management evaluate the company’s performance. Quarterly and annual income statements are more commonly used by investors and creditors to track the overall performance of the company. Income statements usually include a heading with the name of the company, the title of the statement, and the time period. Depending on the company’s size and complexity, the income statement can be large or small. A condensed income statement will have three main categories: revenues, expenses, and net income or loss. Revenues are listed and totaled first with expenses following. The expenses are usually sorted either alphabetically or by dollar amount. After the expenses are totaled, net income can be calculated by subtracting the total expenses from the total income. Here is an example of a basic income statement. 1 What Does Income Statement Mean?